Quiet kitchen appliances are made from quality materials and specific designs that keep all the many moving parts from becoming bothersome background noise to your home life. A quiet refrigerator serves up cold and delicious items every day and more than likely doesn't get a second thought from its hungry owners. When a fridge clanks, ca-chunks or snorts its way through the day, it can be maddening and can wake you up with its midnight snuffling. What Makes a Refrigerator Quiet? When looking to buy a refrigerator, you will have six types from which to choose. Each type will have its own set of pros and cons as well as an ability to stay relatively quiet throughout the day and night as it goes about its cooling business. In many tests on major brand-name appliances, the bottom-freezer and side-by-side models of refrigerators were the quietest models. Consider the space that you have and the size that you need before purchasing a refrigerator. There are a few brands that continually crank out quiet kitchen appliances. The quietest refrigerator compressor could be the Samsung French-door and side-by-side refrigerator. Certain models have two quiet compressors: one each for the fridge compartment and the freezer. 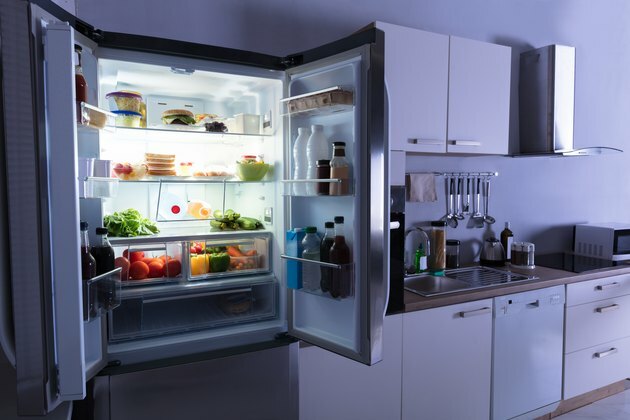 The side-by-side and the bottom-freezer style of refrigerators tend to be larger, although some manufacturers such as Whirlpool and Maytag make smaller versions for mobile homes and other tight kitchen spaces. Kenmore makes a quiet top-freezer refrigerator, model 6898, that is silent as it operates. Maytag's French-door, bottom-freezer refrigerator, model MFX2570AEM, has a decibel score that hovers around the 40s for a fantastically quiet kitchen appliance. Refrigerators with freezers on the top tend to work harder to push the refrigerant through the system. Also, cold air naturally sinks. In a refrigerator that is making maddening noises, the compressor tends to be the main culprit. The evaporator fan located on the compressor can create quite a racket if it isn't made well or installed properly. In general, a kitchen appliance that purrs under 40 decibels is considered to be quite silent for the standard household. A fridge with decibels in the 27 to 45 range is ideal. Understanding how they operate and what makes them tick can help you to choose a quiet fridge or at least fix an issue on a fridge that went from quietly humming to clanking. The refrigerant is the lifeblood of your cold appliance. It runs through the main components. If it is low, it can cause clanking to occur. The team of the expansion valve, compressor, condenser and evaporator all work in tandem to turn the liquid refrigerant into vapors. When all of these work well together, are adequately insulated and are made from quality materials, the hulking kitchen appliance hums along nicely. If any of the many components that keep your yogurt and ribeyes at the best temperature break down, the entire quiet process can turn into a cacophony of maddening noises. What Is Making That Sound? If you bought a refrigerator for its low noise level, and it has performed well for most of its life, but it is beginning to sputter and sigh, then you may need to do a little DIY investigating to get it back to its low hum. The compressor is located at the bottom and back of the fridge and tends to be the main culprit of noisy refrigerators. The condenser's large copper coils may need to be cleaned if the fridge is making intermittent loud clicking noises.